Its a funny word… “Twitter”… and it seems a little strange to send a “tweet” but is it one of the most powerful social media sites on the internet. It has changed the world and communication as we knew it. Imagine yourself standing near the water in NYC next to a phone booth. You see a large jetliner miraculously land on the Hudson River. Within seconds you pick up a land line calling 911. The operator asks you what you are calling about. You say, “a jetliner landed in the Hudson.” She says, “can you repeat that?” Then you start to describe it. It could take you an hour.. years… ok.. 1 million words to describe what was happening before your eyes. At the same time, a man picks up his phone, takes a picture of the plane in the Hudson and sends it out around the world in seconds… literally seconds. The other day I could hear sirens just echoing in Seattle near where I was. A bit concerned and also curious, I went to Twitter and made a simple search on the words “Seattle Fire” and immediately I knew where they were going. Not one, but many people were tweeting including the Seattle Fire Dept. When there was the Japanese tsunami alert, the only way we would know what people who live at the coast were doing was to use twitter. The county Emergency Management has a twitter account. It was good to follow because everyone had to evacuate. I was up early on Saturday watching the seaplanes lining up getting ready to take off on Lake Union and I caught a photo of a stand up paddle boarder cruising by a Kenmore Air Seaplane. 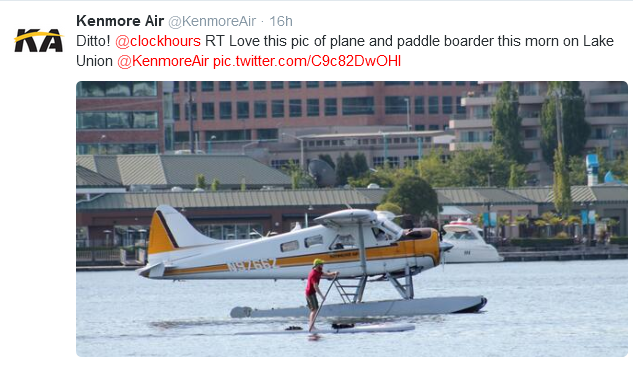 I sent it out on Twitter and Kenmore Air favorited it and it was retweeted many times. The president of the US wakes up and sends out a tweet to the entire world on some issue that is on his mind. Like him or not… those 140 characters make the news almost daily. You can use twitter for real estate. Get on there. Find friends that tweet, ask your friends on FB. Search a word… like Kirkland… and see who is tweeting about the city. You will see names that you might want to start following… the city government, movers and shakers in the area, blog writers. Just keep focusing on Kirkland… and you will build a list of people to follow. Then start retweeting some great tweets. Take photos in Kirkland and of real estate. Use those words in your tweets. It won’t take long until someone tweets something like.. “How do you buy an affordable house in Kirkland?” Tweet back… voila… you are on the way to making it work for your real estate business! Twitter, like all the social media sites can be used as little or as much as you want. Once you get into the “groove” of twitter, you can decide how you might want to make it work for real estate.